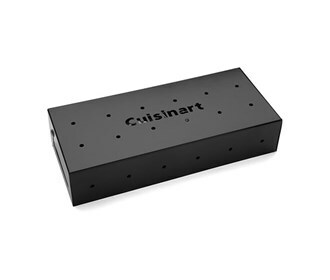 The Cuisinart CSB-158 is a smoke and soak grill box which turns grill into a flavor infusing sensation, combining a classic smoke chip box with a tandem humidifying section so that moist meats can be barbecued while giving them a delicious smoky flavor. When grilling is done, the liquid will evaporate and increase the humidity in the grill to increase the moisture of food. Also, the smoking wood chips will add a great smoky flavor to whatever is cooking. To save space on the grill top, add smoke chips to the liquid reservoir and get creative with favorite liquids. The Smoke and Soak Grill Box works perfectly on gas grills, charcoal, and electric, so you can bring the flavor any way you cook. 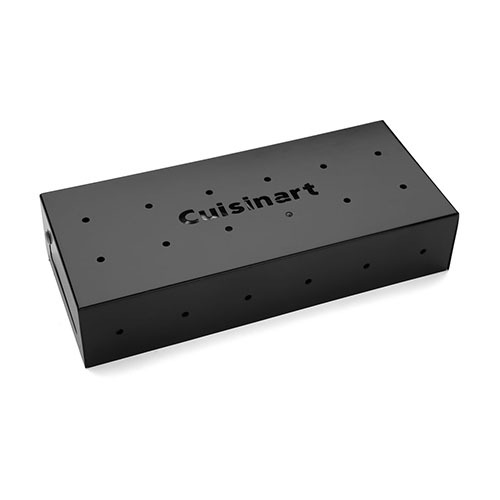 The Cuisinart Smoke and Humidity Grill Box has many exciting features for users of all types. You can extend the lifetime of your Cuisinart Smoke and Humidity Grill Box with the purchase of a FactoryOutletStore Factory Protection Plan. See the Cuisinart Smoke and Humidity Grill Box gallery images above for more product views. The Cuisinart Smoke and Humidity Grill Box is sold as a Brand New Unopened Item.